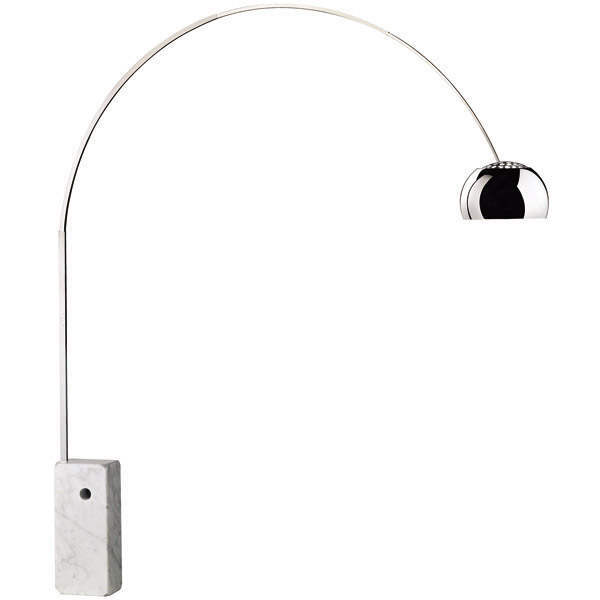 Arc lamp Arco from Flos with spacious arc, swiveling and height adjustable reflector and fine marble base. The iconic floor lamp Arco, first published in the 60s, is still - after about half a century - produced almost unchanged from the Italian design lighting lable Flos. For good reason: The lamp Arco enjoys unbroken popularity then and now and is a real highlight. Whether as a stylish lighting in the living or dining room, as a glamorous light in the lounge area or office meeting room - the arc light Arco attracts attention to itself and evaluates each furnishing concept. The heavy-weight, hand-made marble base in black or white Carrara marble is more than just a noble eye-catcher. It ensures a stable and secure stand of the spacious arc lamp. Nevertheless, the Arco floor lamp is easy to carry. Flos solved this problem by using a rod that can be inserted into the marble base and serves there as an ergonomic carrying aid. The Arco floor lamp by Flos, from the pen of the designer Achille and Pier Giacomo Castiglioni, was ennobled with its admission to the Museum of Modern Art in New York, where the lamp is part of the permanent exhibition. And noblesse oblige - so Arco is not only a sought-after object of design and a stylish lighting, but also a functional light with attention to detail. The wide, adjustable arc of the Arco lamp in satin finished stainless steel allows Arco to protrudes far into the room. Thus, the floor lamp easily take over the function of a hanging lamp, for example, wherever a ceiling light can not be mounted. The reflector made ​​of polished zapon lacquered die-cast aluminum is swivelling and height adjustable, so that an optimal orientation of the light can be achieved. And because the Italian lighting manufacturer operates not only with his designs, but also technically at the highest quality level, there is the Flos arc lamp Arco now available with energy-saving, top modern LED technology as Flos floor lamp Arco LED! Do you have a question about "Arco"? How can we contact you?